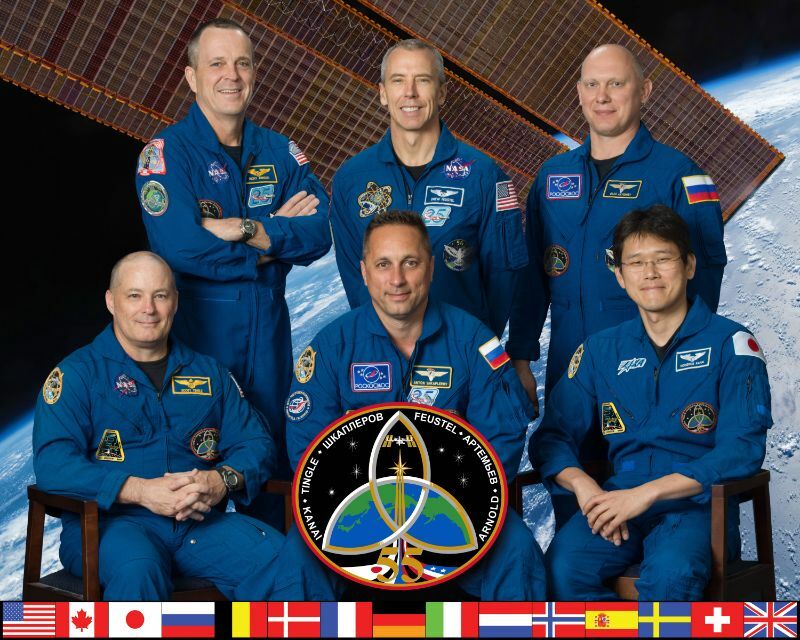 Six small satellites from Japan, Singapore and Italy were released from the International Space Station on Monday to begin a variety of technical demonstration missions with particular focus on orbital debris removal and re-entry systems. The satellites were taken up to the orbiting complex by the HTV-6 cargo spacecraft in December and were deployed by an upgraded J-SSOD deployment mechanism developed in Japan. 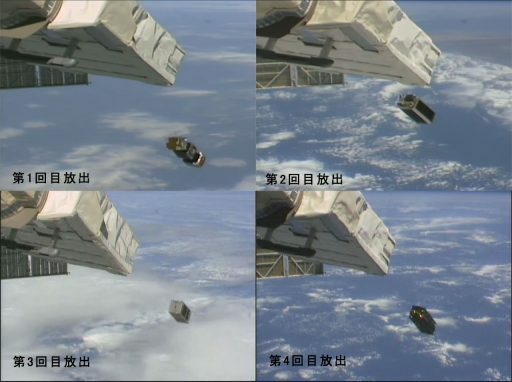 JSSOD is the Japanese Small Satellite Orbital Deployer and was first used in 2012 to mark the first robotic deployment of CubeSats from the Space Station which, by now, has become a standard part of the Station’s operational repertoire with well over 100 satellite deployments in recent years. The 2012 JSSOD deployment served as a pathfinder and was followed by the development of other deployment mechanisms – notably the NanoRacks CubeSat Deployer that has been in use for over 100 satellite deployments, and the SSIKLOPS mechanism which provides an orbital launch pad for non-CubeSat missions. The deployment of CubeSats from ISS has a number of benefits over launching them as secondary payloads with larger satellites. Launching the small satellites packed into an ISS Visiting Vehicle reduces the vibration and loads they encounter during launch, reducing the chances of damage during launch. Also, once aboard the Station, satellites can be visually checked to ensure they are in a good configuration before committing them to flight. Furthermore, the Space Station’s orbit is almost ideally suited for CubeSat missions dedicated to technical demonstrations or education purposes since it gives the satellites a finite orbital lifetime of six months to a year – mitigating potential debris issues arising when short-duration satellite missions are deployed into longer-lived orbits. On the flip-side, operational CubeSat missions with a longer life expectancy may find the ISS orbit insufficient for their objectives. The HTV-6 mission delivered a pair of JSSOD deployment mechanisms – JSSOD-5 that only contained the STARS-C CubeSat released on December 19, 2016 and the upgraded JSSOD-6 comprising four deployers with a total capacity of 12 CubeSat Units. 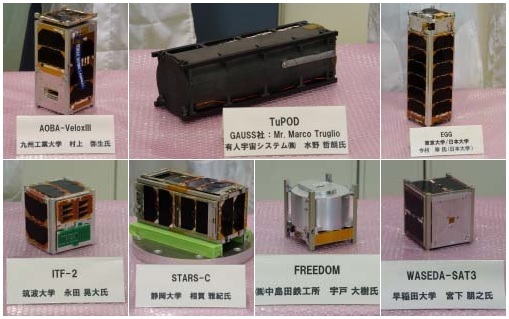 These 12 CubeSat Units were occupied by a total of six satellites, bringing the total number of CubeSats deployed from Kibo to 154. 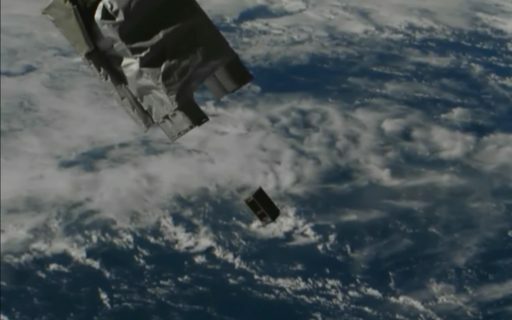 Monday’s deployment operation began at around 9:11 UTC with the simultaneous release of three satellites from the first deployer on the JSSOD that contained 1U CubeSats – all built by Japanese Universities: ITF-2, WASEDA-Sat-3 and FREEDOM. The second deployment came at around 9:23 UTC from the second JSSOD mechanism that held the 3U EGG CubeSat. 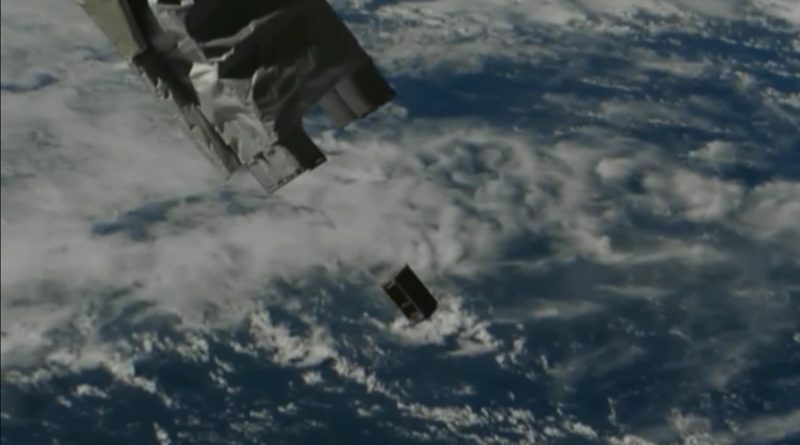 AOBA-VELOX-3, a 2U CubeSat, was sent on its way at 10:40 UTC and was followed by the TuPOD at 10:50 UTC – a 3U CubeSat that will release a pair of smaller sub-satellites on Friday. ITF-2 (Imagine The Future 2) is the second satellite launched as part of a project of Tsukuba University. 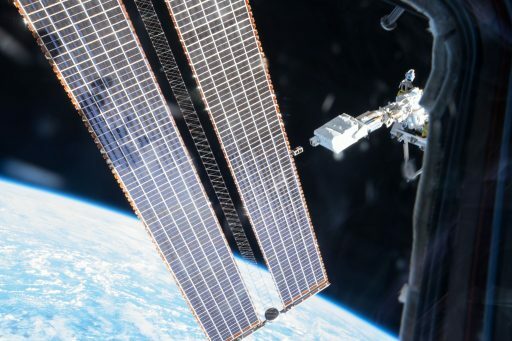 It carries a standard-definition camera for Earth imaging and a micro-engineered antenna suitable for nano-satellite missions to be tested in space. The satellite also hosts a Ferroelectric RAM micro computer that is to be tested in the harsh radiation environment of space. FREEDOM, also complying with the 10 x 10 x 10-centimeter 1U form factor, will demonstrate a deployable de-orbit sail known as DOM1500. 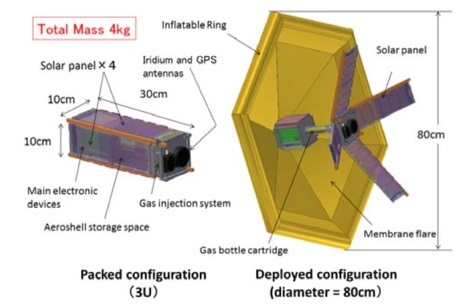 Built by Tohoku University, the satellite will deploy a 1 by 1.5-meter sail to accelerate orbital decay, the speed of its orbital decline will be measured by means of ground-based tracking and GPS. 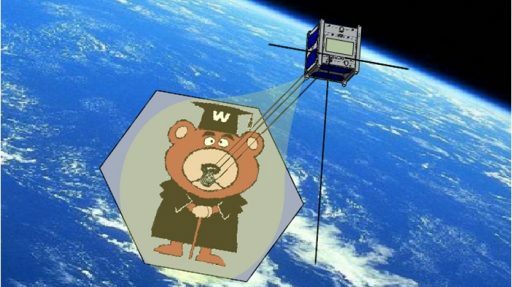 WasedaSat-3, a project of Waseda University, aims to deploy a hexagonal chute of thin film material to act as a drag sail as well as a projection screen with a small-sized LCD projector in charge of displaying images onto the screen to be captured by a color camera. A secondary purpose of the LCD is a study of whether it can be used to assist in thermal control by displaying a white color when no increase in temperature is required and switching to black when the satellite needs to be warmed up. The EGG Satellite (re-Entry satellite with Gossamer aeroshell and GPS/Iridium) was developed at the University of Tokyo and will demonstrate a deployable aeroshell to first act as a drag device and then protect the satellite during the initial stages of re-entry. The 80-centimeter diameter gossamer aeroshell is made of a 12.5-micrometer Zylon polymer fiber material that can withstand extreme temperatures and will protect the satellite in the first stages of re-entry (down to 6km/s) to provide data on whether such a system is suitable for future small satellites with return capability. AOBA-VELOX-3 is a technology demonstrator from Japan and Singapore, hosting three innovative systems for future application in a variety of missions. The satellite tests out a pulsed plasma propulsion system which is driven by Teflon propellant that is turned into a charged plasma by an electrical arc followed by the acceleration of plasma particles in an electric field to generate thrust. This system is envisioned to extend a small satellite’s orbital lifetime by a factor of two. The other two tech demos on the satellite are a WiFi-based onboard communications architecture, enabling wireless communications between the different satellite systems, and a series of commercially available microprocessors are to be studied in the radiation environment of Low Earth Orbit. TuPOD is a fully 3D-printed CubeSat developed by Gauss Srl. in Italy and acts as a 3U CubeSat Deployment System. It holds a pair of 0.75-Kilogram TubeSat PicoSatellites – Tancredo-1 and ONSAT, both based on an Interorbital Systems (IOS) satellite kit. 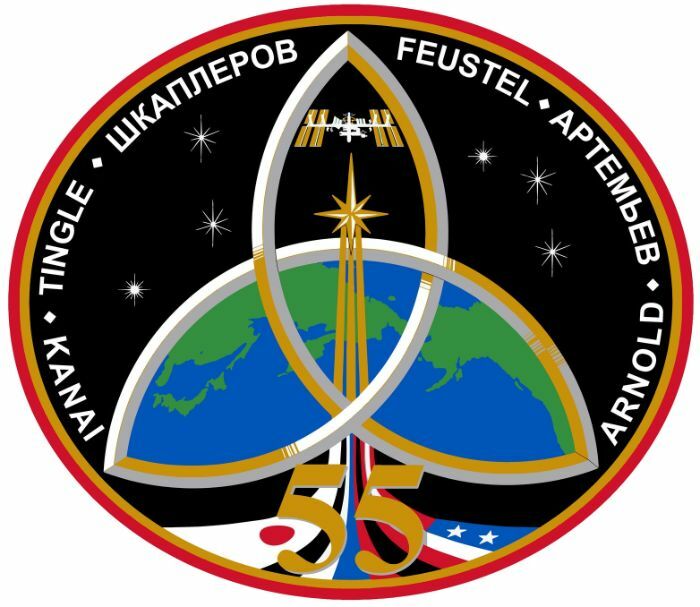 The two TubeSats will be deployed from TuPOD on Friday, 83 hours after release from ISS, and the parent satellite will continue transmitting a Morse Code until its batteries run out. The Brazilian Tancredo-1 is an educational satellite that aims to engage elementary school students in science and technology. It carries a voice recorder transmitting a message chosen in a contest and provides telemetry data in the amateur radio bands. ONSAT is operated by Open Space Network, a Californian Space space startup.